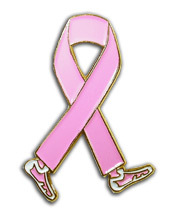 Buy this Breast Cancer Awareness Pink Ribbon Walk Lapel Pin. This pink ribbon walk lapel pin is a great gift idea or fundraising product for breast cancer awareness walks, runs and fundraisers. The pin comes with a clutch back and is individually poly bagged. Enter the quantity of pins you wish to order, then click "Add to Cart."